If you are a heavy Apple iTunes user your iTunes music library might contain music that is not longer on the computer system or duplicate music. 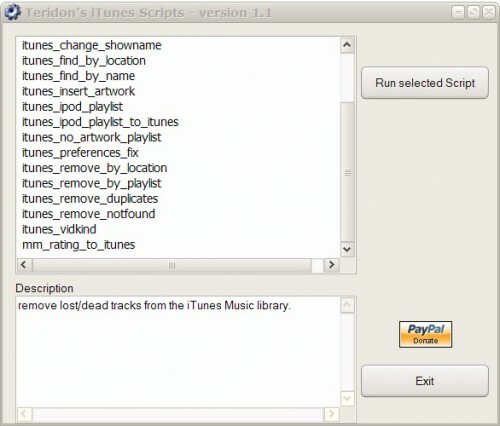 Teridon’s iTunes Scripts are a collection of scripts for Apple iTunes that can perform various tasks like scanning the iTunes music library for duplicate music or removing music that is no longer on the computer system. The script collection is completely portable and can be executed right after downloading and unpacking. A total of 19 different scripts are available that can be executed from the interface. The scripts usually spawn a dos window that will execute the selected script. A selection of the script itunes_not_found will for example scan the iTunes music library for music that is no longer available on the local hard drive. Other cleanup scripts include the search for duplicate music in iTunes. Some scripts require user input like removing songs based on a playlist or location. The script collection will usually list the available options and wait for keyboard input to continue executing the script. Teridon’s iTunes Scripts provide a great way of cleaning up the music collection in Apple iTunes. The script collection does contain several additional scripts that might be worth a try. One interesting script is for example the one that will create a playlist containing all songs of a connected iPod. The scripts are also available as Perl scripts for users who do not like to download the executables. They have been tested both with iTunes 6 and 7 but most should work fine if iTunes 8 is installed on the computer system as well.